In 2004, Professor Behrokh Khoshnevis of the University of South Carolina attempted the first 3D printed wall. Since then, this innovation has exploded and it’s now possible to build a house in just 20 hours! The professor developed an FDM 3D printer, mounted on a robotic arm, that extrudes concrete layers instead of plastic to create a 3D model. This Contour Crafting technology demonstrated all the qualities needed to use additive manufacturing on construction sites: reduction in costs and waste, faster construction speed, reduction of accidents, complex architectural shapes, and more. His discovery marked the beginning of 3D printing in construction. However, it remains much less used than certain sectors such as aeronautics or medical. 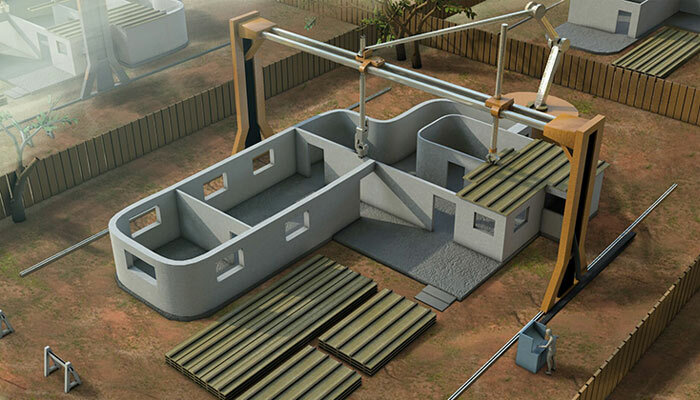 Large scale, industrial concrete printers can create whole house structures autonomously. Construction giants are quickly realising the potential of of 3D technologies and their impact on the future of construction. 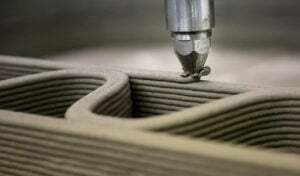 The concrete 3D printing market is expected to reach $56.4m in 2021, and with good reason. More and more companies are starting up in the sector to create new, innovative projects. Some are more futuristic, some are very real in the present, such as Apis Cor’s 3D printed house in 24 hours. 3D concrete printing is developing rapidly and relies on different technologies and materials, offering many benefits to its users. The tech is still in its infancy however and is bound by current limitations. What 3D printing processes in the construction sector? The Contour Crafting method involves the building material being deposited to create a large-scale 3D model with a smooth surface finish. Rails are installed around the building ground that will act as a structure to direct the robotic arm. It moves back and forth to extrude the concrete, layer-by-layer. Trowels placed on the side and above the nozzle to flatten the extruded layers and ensure the model’s strength. In this process, conventional concrete cannot be used as it would need to harden before you could continue the process. 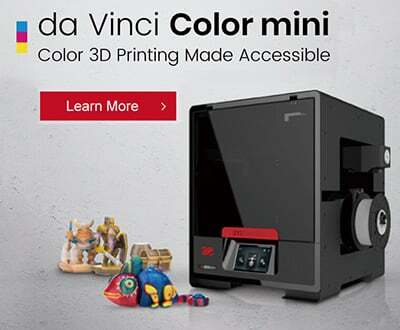 If it was 3D printed it therefore wouldn’t be able to support its own weight. Therefore, concrete is used with quick setting properties. Contour Crafting (company with the same name as the method) are very discreet about their progress. Chinese construction company WinSun Decoration Engineering Co describes it as able to “steal the show” however. These machines are huge (32m long, 10m wide and 6.6m tall). 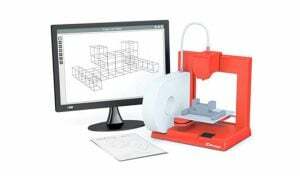 This enables them to 3D print full structures and assemble them on the spot. This is done through mixing concrete and glass fibres on-site and then printing. This feat made made builders and construction workers aware of additive manufacturing. Constructions-3D are a competing company who are also trying to 3D print large concrete buildings using this tech. The different market players have developed machines using a variety of different technologies to 3D print concrete. French company Constructions-3D have created a polar 3D printer which prints whilst inside the construction site, and then leave through the front door of the building once construction is finished. 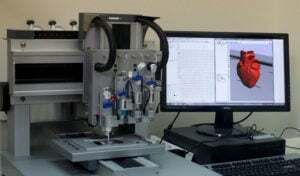 It consists of a mechanical base, and robotic arm with a nozzle for extruding the material at the end. This arm offers a printable area of more than 250 m² and over 8 metres high. Cazza Construction’s robot is similar to this, involving a mobile crane system allowing them to 3D print a far wider area and create larger and taller structures. This is shown in past prints from companies like Apis Cor and XtreeE, quickly creating whole houses. 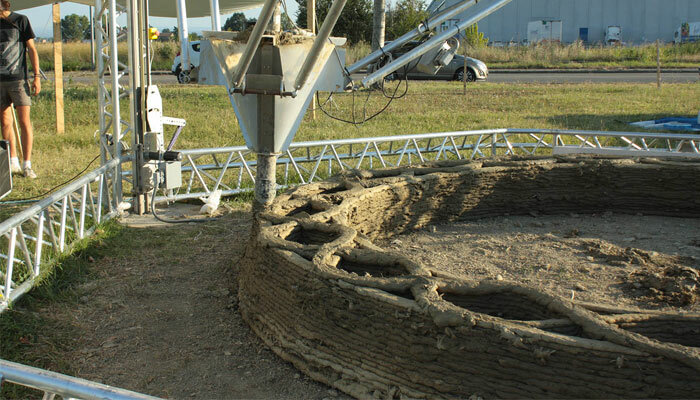 Batiprint 3D are a French company aiming to 3D print large structures. 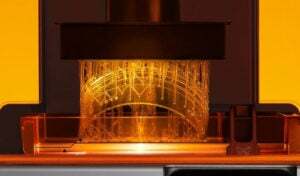 Italian architect Enrico Dini first made waves as ‘the man who 3D prints houses.’ More recently, he demonstrated an interesting 3D printing process using his ‘D-Shape’ 3D printer. This machine relies on the binding of powder which makes it possible to solidify a layer of material with a binder. Layers of sand are deposited according to the desired thickness before a print head pours droplets (the binder) to harden the sand. 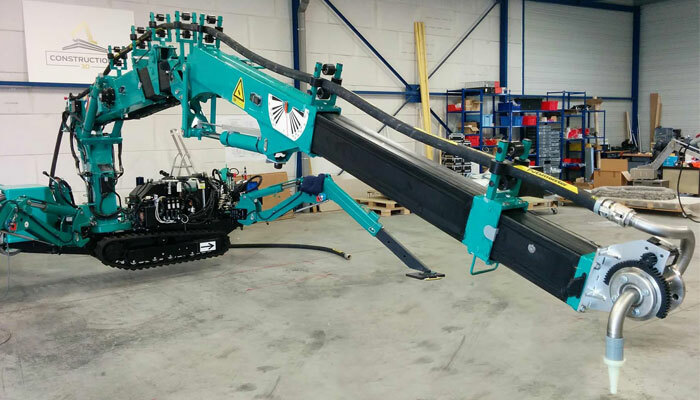 This 4 x 4 metre machine can create large structures of up to 6 cubic metres in size. 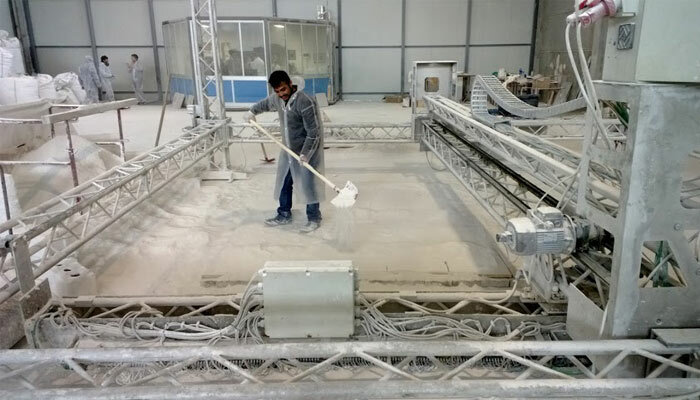 The print site where the D-Shape will 3D print a concrete structure. 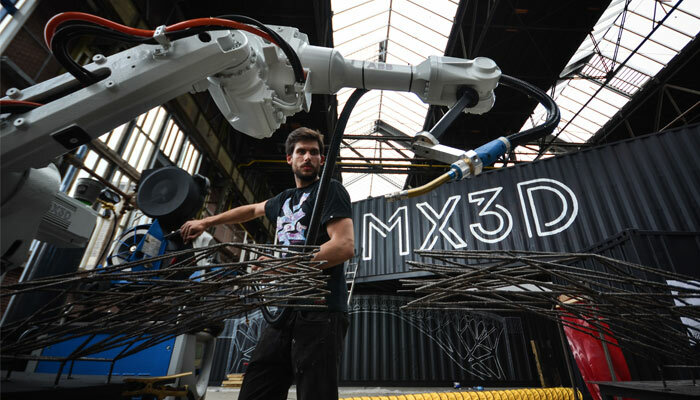 Dutch company MX3D have developed a unique construction method called WAAM (Wire Arc Additive Manufacturing), which enables you to 3D print metal structures with a 6-axis robot that drops 2 kilos of material per hour. MX3D are one of a number of innovative startups in the 3D printed house sector. Though conceptualised by startups, these projects often require support by bigger names in construction. The Royal BAM Group partnered with Eindhoven University of Technology to design a 3D printed concrete bridge for cyclists. 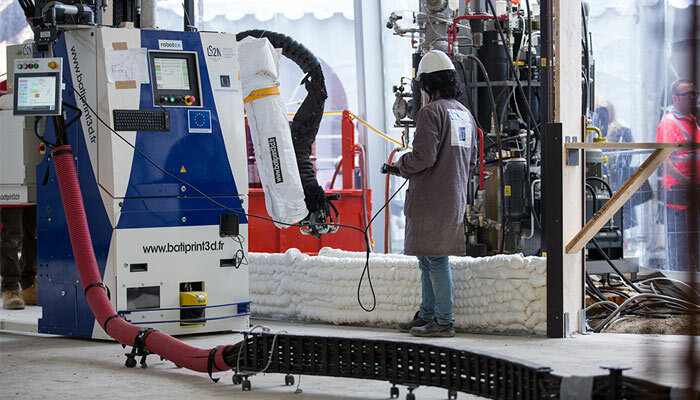 In addition, Bouygues Construction turned to 3D printing to build houses in the Lille, France. 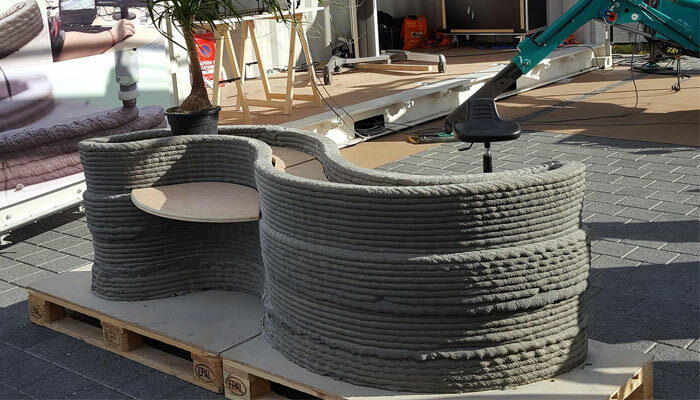 Moreover, Vinci Construction partnered with French startup XtreeE to test the construction of complex structures, and Swedish group Skanska recently collaborated with the University of Loughborough to develop a 3D concrete printing process. “we combined an industrial robot with a welding machine to turn it into a 3D printer that works with our own software,” – MX3D team. Why use 3D printing in construction? 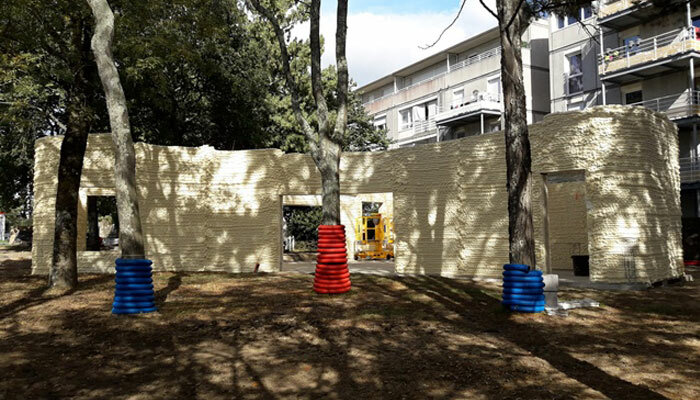 His team managed to print in 3D a 95m² house, and the first 3D printed social housing in the city. Benoit says their BatiPrint technology has also made it easier to create curved shapes at a lower cost. Moreover, as 3D printers don’t need to eat or sleep, they don’t stop working until the project is finished. This greatly reduces waiting times. 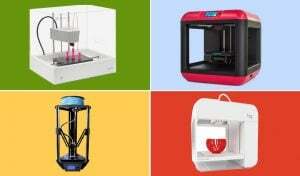 However, there are still caveats to the dream of 3D printing houses, bridges and skyscrapers. Axel Thèry of Constructions-3D explains that “the main difficulties come from the fact that the process of 3D printing buildings is not today recognized as a construction method by many codes and standards bodies. As the printed structures are not traditional, the calculations of resistance and resistance in time are difficult to realize, that is why the habitable works will have to be tested on a case by case basis at the beginning.” These standards bodies are concerned whether these structures are really solid and if they can withstand their environments. Constructions-3D’s machine resembles a huge tractor, and 3D prints concrete to make large structures. 3D printed house: a solution to the housing crisis? Since 3D printing now allows structures to be created more quickly, it is ideal to combat the housing crisis. 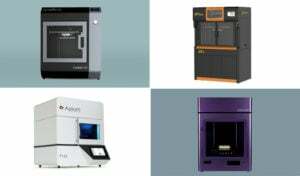 Some companies are gravitating towards additive manufacturing as a result. 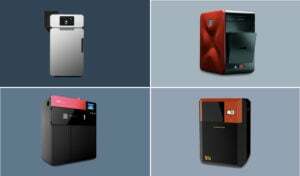 This includes Italian company WASP, which aims to build a more sustainable world through 3D printing. They have developed one of the world’s largest 3D printers which is capable of building homes from locally sourced materials using solar, wind, or hydro power. This enables regions that don’t yet have access to electricity to 3D print environmentally friendly structures with local resources. WASP 3D printers at work to create a future where environmentally friendly materials create 3D printed houses. Similarly in Brazil, Anielle Guedes founded Urban3D to respond to Brazil’s housing crisis. Her company 3D prints parts of buildings in a dedicated factory before assembling them on-site. This enables her to create buildings of a height that is not possible if 3D printing was done on-site. The company is currently testing several prototypes and hopes to provide a solution to the development of Brazilian shantytowns. 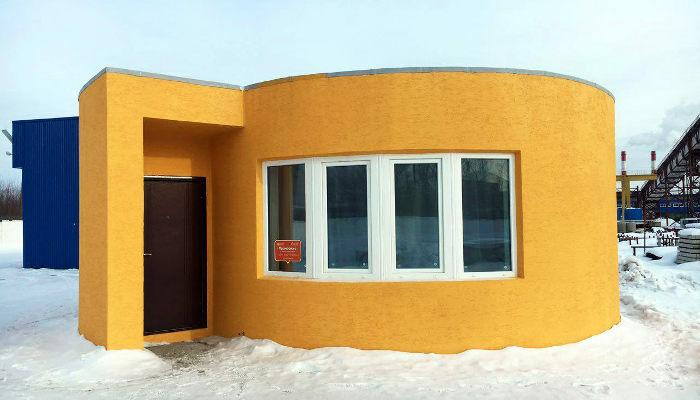 Russian company Apis Cor built this house in just 24 hours using their concrete 3D printer. 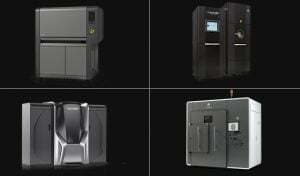 Additive manufacturing could also be a way for humanity to explore space. NASA has launched the ‘3D Printed Habitat Challenge‘ examining technologies used to build homes in space, such as on the Moon or on Mars. 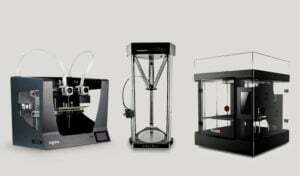 Although ambitious, it is too early to tell if 3D printing is a viable solution. We can tell however, that 3D printing in construction is to become a very real global force. SmarTech Publishing recently published a report predicting global revenues in the sector to be $40bn in 2027. To go from a few million dollars to $40bn in 10 years is astonishing. Therefore, we will have to see how the world reacts to this tech in the future. Did you enjoy our feature story on 3D printing in construction? Let us know in a comment below or on our Facebook and Twitter pages! 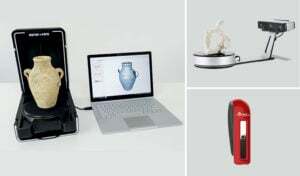 Sign up for our free weekly Newsletter, all the latest news in 3D printing straight to your inbox!